Saints will host Newcastle Falcons in the semi-finals of the Premiership Rugby Cup. Chris Boyd's men confirmed their place in the final four with a bonus-point win against Leicester Tigers last weekend. But they had to wait until earlier today to discover who they would be facing and whether they would have home advantage. Newcastle's game at Sale was key because if the Falcons had bagged a bonus-point success and won by 37 points or more they would have hosted Saints. 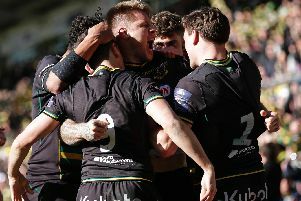 As it was, Newcastle did get the maximum haul but they could only win by 16 points, earning a 28-12 victory at the AJ Bell Stadium on Sunday afternoon. That means the Falcons must travel to Saints on Saturday (February 9) for a game that will kick-off at 12.15pm. It will be shown live on BT Sport. In the other semi-final, Worcester Warriors will host Saracens on Friday night, having just edged out the Barnet-based club on points difference in the bid to win Pool B.
Saints won Pool C, with Newcastle topping Pool A. The final will take place on Sunday, March 17.